Hurlburt Field is located on the Gulf of Mexico in the Florida Panhandle, 35 miles east of Pensacola. Hurlburt Field is very close to Eglin AFB. This area is also known as the Emerald Coast and is a major tourist attraction for its breathtaking white beaches and the emerald green waters. 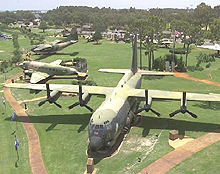 Hurlburt Field is home to the Air Force Special Operations Command and the 1st Special Operations Wing and has a long and distinctive history.